Filmmaker, writer, critic and curator Jonas Mekas, a driving force behind American independent cinema and the founder and artistic director of Anthology Film Archives, will be presented in a retrospective exhibition summer 2006 at BAC, Baltic Art Center in Visby. 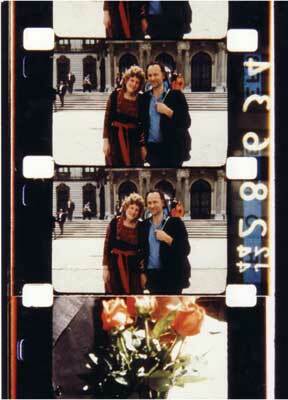 Mekas’s work will be presented in an extensive project consisting of video installations and screenings of his films. The exhibition takes us through the development of Mekas’s work, which is already part of the history of independent filmmaking, and also showcases his most recent projects, including video installation Home Videos (1987–2005). The second 6 screen and one projection video installation will include: Travels (five short travelogues from Italy, Russia, and Sweden, 7 min, 1970), Happy Birthday to John (a homage to John Lennon, 24 min, 1996), Cassis (condensing an idyllic three hour sunset into four minutes of film, 4 min, 1966), Notes on the Circus (12 min, 1966), Film For Maya: Father and Daughter (4.5 min, 2005) and the double-film Elvis (incorporating footage from Elvis Presley’s last concert, 1 min, 2001) and Wien & Mozart (1 min, 2001). The third part with screenings of Jonas Mekas’s films consists of six programmes, including the celebrated earlier films Diaries, Notes & Sketches a.k.a. Walden, Lost, Lost, Lost, He Stands in a Desert Counting the Seconds of his Life, Reminiscences of a Journey to Lithuania, As I Was Moving Ahead I Saw Brief Glimpses of Beauty, Biographical Quartet and the recent film A Letter From Greenpoint. The exhibition will show important new developments in Jonas Mekas’s work together with older pieces that are already classics of independent filmmaking. The exhibition at BAC will resent most of the material of Jonas Mekas’s project shown in Lithuanian Pavilion at Venice Biennale 2005. Jonas Mekas was born in Semeniskiai, Lithuania, in 1922. He lives and works in New York. After being imprisoned by the Nazis in a forced-labour camp and a period in Belgian Displaced Person camps, Mekas studied philosophy at the University of Mainz 1946–1948. He then emigrated with his brother Adolfas to the United States, settling in Williamsburg, Brooklyn. Mekas discovered avant-garde film at venues such as Amos Vogel’s Cinema 16, and began to screen his own films in 1953. In 1954 he became Editor-in-Chief of Film Culture magazine, and in 1958 he began his groundbreaking “Movie Journal” column in The Village Voice. In 1962 Mekas founded the Film-makers’ Cooperative (FMC) and in 1964 the Filmmakers?ECinematheque. The latter eventually grew into Anthology Film Archives, one of the world’s largest repositories of avant-garde film, which Mekas continues to direct. Mekas’s film output includes narrative (Guns of the Trees, 1961), documentary (The Brig, 1963) and diaries (Walden, 1969; Lost, Lost, Lost, 1975; Reminiscences of a Voyage to Lithuania, 1972; Zefiro Torna, 1992, and As I Was Moving Ahead, Occasionally I Saw Brief Glimpses of Beauty, 2001). In addition to his prolific output in film, Jonas Mekas has published 24 volumes of poetry, essays, interviews, and diaries, and has been the subject of 12 book-length studies. His films have been exhibited in museums and galleries around the world, including Jeu de Paume in Paris, the Metropolitan Museum of Photography in Tokyo, Documenta 11, the Venice Biennale, and many others.